HINKLEY – Residents in Hinkley are all too familiar with groundwater testing. Under order, Pacific Gas and Electric is required to test homes within the community on quarterly schedules for hexavalent chromium. But lately, higher levels of manganese and arsenic have become a newer concern. Testing has shown manganese and arsenic levels are above state water drinking standards in some local wells. Experts believe the elements may occur naturally at a higher level in the area, or the high levels could be due to historical farming activities. Kemper said the state drinking water standard for manganese is very high at 0.5 milligrams per liter. She said in Hinkley there are some cases that are above that level. According to Kemper, manganese isn’t so much a health concern as a nuisance. As part of its cleanup efforts PG&E is injecting ethanol into the groundwater to turn the toxin hexavalent chromium into the nutrient trivalent chromium. It is believed this injection was causing higher levels of arsenic and manganese in the area’s water supply, but a set of wells directly north of the plume are detecting no manganese or arsenic, which is also the direction of groundwater flow, according to Kemper. “It is something that we’re concerned about and that we’ve require PG&E to monitor as it involves their ethanol injections and seeking information for where sources might be,” Kemper said. As a possibility, “people pumping could pull the water,” she said. Arsenic is a cancer-causing chemical element and is set at a state drinking water standard of 0.010 milligrams per liter. PG&E spokesman Jeff Smith said the company does not take any responsibility for manganese and arsenic found in the area’s groundwater. “The results from our testing have revealed that manganese or arsenic resulting from any activity have not impacted any water on any domestic wells in Hinkley,” Smith said. He said before the company began remediation efforts they collected data on the background levels of manganese and arsenic in the area. They believe any detection of these chemicals is a result of their natural existence. “Natural occurrences of manganese and arsenic are typical throughout the western United States,” he said. A meeting scheduled to inform the public on manganese and arsenic has been postponed to February as the Water Quality Control Board does a more technical review and study of the area, Kemper said. Ongoing updates to the groundwater cleanup in Hinkley are reported at www.waterboards.ca.gov. The next water board meeting to discuss the Environmental Impact Report and Cleanup and Abatement Order will be held Wednesday at 7 p.m. at the Lenwood Hampton Inn. 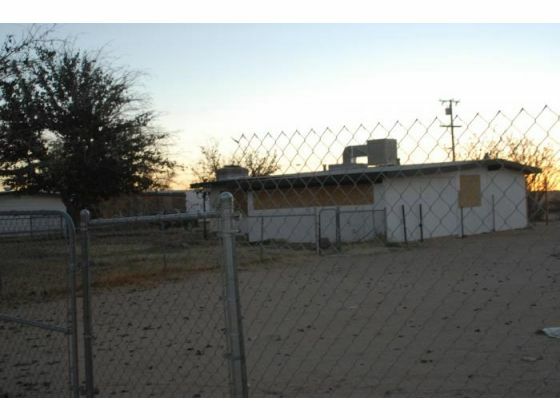 A boarded up house, a part of Pacific Gas and Electric’s Property Purchase program, sits on Mulberry Avenue in Hinkley. According to local resident Julie Heggenberger, the groundwater at her relative’s house next door tested 85 ug/L of arsenic, a level exponentially above the state’s drinking water standard.